Core Slugs Caught in 20-Story Wonder | Grunau Company, Inc. 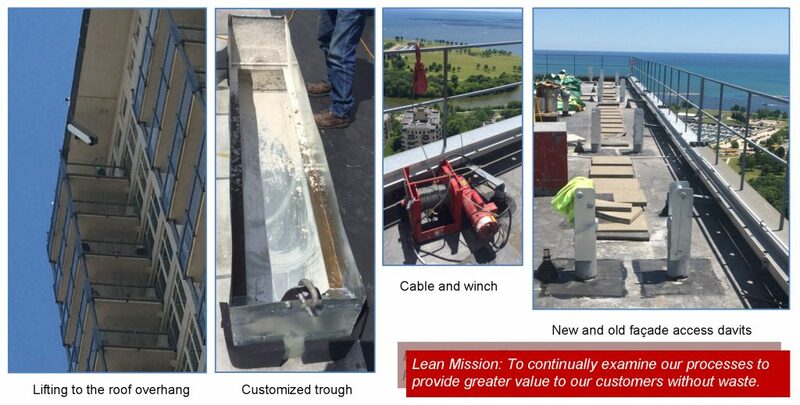 When our Grunau Metals project team was faced with finding a safe and efficient way to catch concrete core slugs from 20 floors above street-level, creative minds went to work. This was a real-life situation where Lean problem solving skills were used. A condominium along Milwaukee’s waterfront has an 8-foot cantilevered roof overhanging the entire perimeter. Because of this design, access to the building façade for maintenance or repairs required lowering cables through 1-1/2″ pipe rigging sleeves which penetrated the overhang. The originally designed sleeves were too small and too close to the building, resulting in window washers operating unsafely when approaching the top of the building. Grunau Metals fabricated and installed new 5″ pipe sleeves, larger and further from the façade than the building’s originals. These 125-lb davits were transported to the roof and epoxy-anchored before flashed and sealed by a local roofing contractor (who was simultaneously replacing the roof). The overhang was constructed of precast slab as much as 7″ thick and needed 5″ holes cored through for placing the new davits. When coring concrete, typically the core slugs would drop through the floor into a bucket. In this case, the closest floor was 250 feet below, and a 15-lb falling core could mean someone’s life. To solve this safety concern, Grunau Metals designed a trough-like box that could be lifted by an electric winch through the existing sleeve holes, and held snug to the underside of the overhang. This way, when the coring machine punched through the slab, the slug fell safely into the waiting trough, just a few inches below. After catching the slug, the crew lowered the trough to one of the six top balconies, or all the way to the ground depending on the side of the building, and then moved the cables to set up the next lift. This process was repeated a total of 25 times over the course of 4 days! Over 800 linear feet of cable and rope were used for the work: 250LF of 5/16″ steel cable to carry the load of the box and cores, 300LF of 1/2″ rope for a secondary safety line to pull the other side of the trough tight to the overhang, and 300LF of 3/8″ tag line to guide the box from below, keeping it from swinging and bumping the building façade. Bumper pads were also attached to the trough corners to protect from scratching and noise. This is a great example of a team effort to solve a problem, eliminate waste, and resolve safety concerns. This idea worked wonders in getting the job done quickly and safely.